I have a few friends and family who send newsletters every Christmas. I look forward to these missives with great joy. In the days before Facebook, it was the only way to stay abreast of the life events of distant friends. In these days of instant messaging and social media, I find them still a wonderful source of information and something more. A Christmas letter is a retelling of one year in the life of a family and it is amazing to see 365 days of important events unfold within a few sparse paragraphs. I love to see the march of time as told by a family matriarch or patriarch. I love to read the words of my late husband’s best friend from college, even if his news is sad to hear. So, this year I decided to write a Christmas letter. Whether you read this on a page of paper or via backlit screen, know that I am happy to share our life with you this joyous season. “How are the boys?” I hear this question wherever I go. I am glad to say, they are doing well. Freddie Holliday III is 13 years old and he grew over the summer and is now almost as tall as his father. His voice changed and he quite likes his new adult voice. He is now in 7th Grade at Ivymount School in Silver Spring, Maryland. He got an award last spring in his science class for best presentation on his science fair experiment. He collected data about logo recognition rates among preschool children who watch television. It was a cool project. Isaac Holliday is a five-year-old in kindergarten at Murch Elementary in Washington DC. He is a joyous child and recently had a great deal of fun playing the donkey in the Christmas pageant. He has been struggling with learning to read. We have been very blessed to have my boyfriend-Ben Merrion tutor Isaac as Ben works in the adult literacy department at MLK, Jr. Library and is a wonderful teacher. Speaking of Ben, we have been dating for over a year and this summer Ben made his first trip to Oklahoma to visit my family. He was such an amazing help in guiding the children through the airport during the trip. I also got to meet Ben’s Mother and sister this fall and we had a grand time. We also have been blessed to meet the amazing Kait B. Roe. She is patient advocate too. She has recently moved to DC and has agreed to help with night-sitting when I am out of town speaking. We are overjoyed to have her as part of our life. 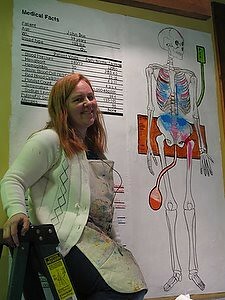 I am so glad Kait is here to help because I travel a lot to speak and paint about the patient view. I owe a great deal of thanks to everyone who helped out in 2011 while I was gone. So thank you to Ben, Kait, Joan Holliday, Courtney Mazza, Megan Michell, Eleanor Franc, Emily Stewart, Liam Kemp, Pete Wright, Cindy Throop, Shoshannah Kantor, Nora Reno, Miriam Cutelis and Robin McGrew. This was the year I traveled nationally to speak about our family medical story and the tragedy of Fred’s medical care. I delivered over 20 speeches this year visiting Florida, Oklahoma, Illinois, Missouri, Maryland, Tennessee, Pennsylvania, California, Oregon, Texas and Puerto Rico. 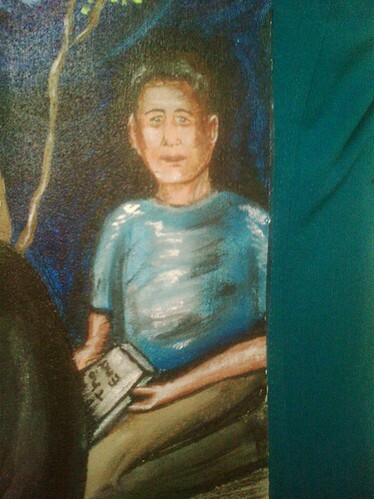 Most of the venues that ask me to speak also allowed me to paint onsite. It was amazing to set up in the back of grand ballrooms and paint the words spoken at these august events filtering the images through the patient view. Most venues asked me to deliver a second speech at the conclusion of the conferences explaining the paintings created over the days of the conference. In June of this year Charles Denham, MD offered me a one year fellowship with TMIT (Texas Medical Institute of Technology). As part of the process of being a fellow, he asked me what TMIT could do to advance patient advocacy. I mentioned that conference attendees wrote to me after my speeches telling me how much the patient story was affecting their lives and profession. They were asking for other speakers like me. While within patient communities people who wished to speak often had no way of becoming connected to facilities that needed patient speakers. So when Chuck asked me his question, I responded that we needed a patient speaker’s bureau. For the last six months Chuck and the great team at TMIT have been doing exactly that. We now have a site called SpeakerLink.org and over sixty speakers have completed profiles and many providers have logged on to find likely speakers. Thank God that Chuck Denham and the TMIT team met me a little over a year ago. SpeakerLink.org is such a blessing! 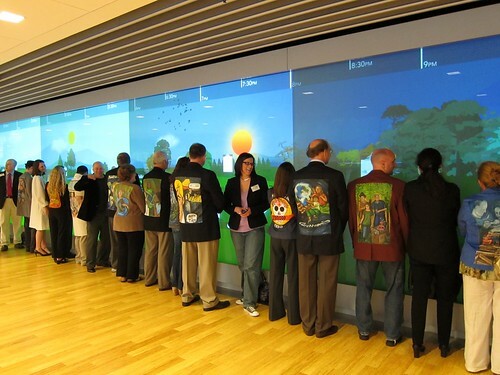 Another amazing creation in 2011 was The Walking Gallery. In April, I attended the opening of a new Kaiser Permanente facility in DC called the KP Center for Total Health. It was a lovely place: a medical facility lit like a gallery. I immediately wanted to have a gallery show in the space. But we would not pound a single nail. All the art would be worn on the backs of business suit jackets and lab coats. Ted Eytan, MD with KP thought it was a great idea and the KP team thought the proposal over and by the end of the month we had approval. At the end of April, I and five other artists began to paint. 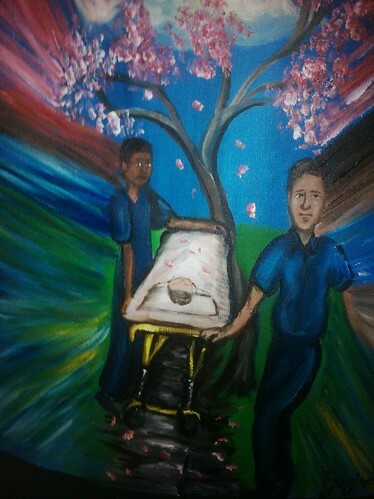 On the night of June 7th 54 people walked with fine art paintings depicting patient stories on their backs. It was an amazing and sacred experience. 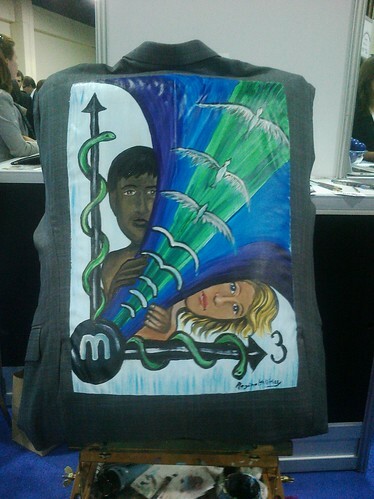 At this point there are 107 jackets in the Walking Gallery and the movement grows larger each day you can view the entire gallery at Welcome to The Walking Gallery - Regina Holliday's Medical ... Those that walk in their jackets have attended events and medical conferences throughout the United States and in a great deal of Europe. We now have walkers on five continents spreading the power of the patient story. So that was this year. We are well, happy and so very blessed. And I hope 2012 is another wonderful year filled with advocacy and loving friends. God bless you as you each walk on your own path and I hope to see you along the way. 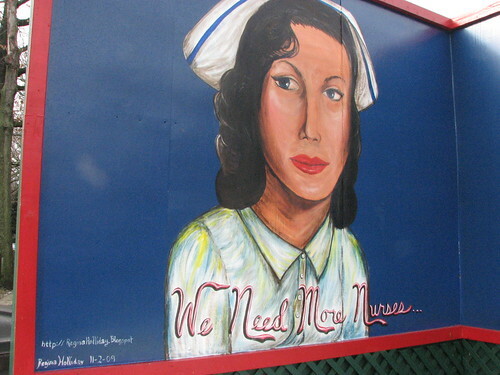 CareMoms as well my regular entries from this advocacy blog. A little over a year ago I met Dr. Chuck Denham, CEO of TMIT (Texas Medical Institute of Technology) on the Stage of the Quality Net 2010 conference in Baltimore. I had just finished a moving speech about the importance patient/family access to the electronic medical record. After I finished speaking, Chuck decided he must meet with me. Before we had even begun the after speech Q&A, Chuck asked me if I would like to be involved in his massive patient advocacy project with TMIT hosted at SafteryLeaders.org. I said yes, and we announced on stage that we would work together to promote great positive changes in patient safety in 2011. Soon after that, I met with his film team. We filmed a short video at IHI in December 2011. It was entitled Remember Your Hollidays. The film team of Colin Gabriel and Matthew Listiak edited it the video quickly and it was posted on youtube in late December. CareMoms — SafetyLeaders.org The focus of CareMoms, as defined by SafteyLeaders, is to engage and develop leaders – who are moms, dads, grandparents, sons, and daughters in the community. These people can bring their power of persuasion to reduce healthcare accidents that cause more than 200,000 deaths in America, and many more globally. These CareMoms/Dads can rally around their local hospitals and give them concepts, tools, and resources that hospital leaders and healthcare governance boards need to "chase zero" accidents and win the war on healthcare harm. 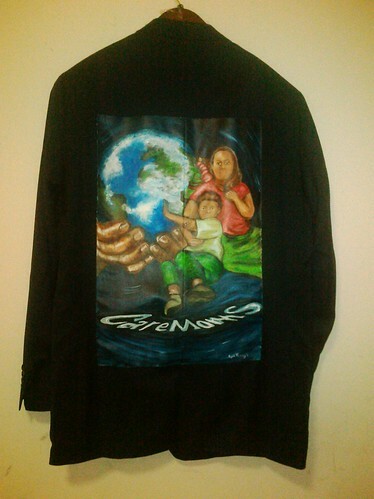 After discussing this concept with Chuck, I designed his jacket for the Walking Gallery, a patient advocacy movement consisting of wearable art, using an image of a universal and infinite CareMother encircling our world. Soon Chuck asked me what I would recommend as the greatest thing that TMIT could create to further the work of patient advocacy. I told him a Speakers Bureau for patients. For the last six month, the TMIT team has been doing exactly that. 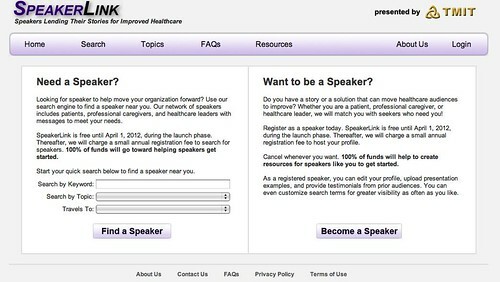 SpeakerLink.org: a site where seeking facilities can find health policy speakers with a patient or patient-centric view. I tweeted my joy from the back of the room upon seeing our dream become reality. Then the actress and patient advocate Alicia Cole began to speak. She told a powerful story of her brush with death due to a hospital inquired infection. She spoke in loving terms of her Mother and Father who stood at her side as steadfast advocates, thereby saving her life. She mentioned how her mother saw a black spot no larger than a dot from a sharper marker. a dot that would have grown and killed Alicia in hours without her Mother’s intervention. Alicia was an amazing patient speaker and encapsulated the reason why we speak. Her words can change our world. Please remember us this Holiday Season. Remember the Hollidays. Remember the Alicia’s. Remember the black dot that was not a speck of coal within a Christmas stocking, but instead a speck on Cole. Remember a mother who saved her child. 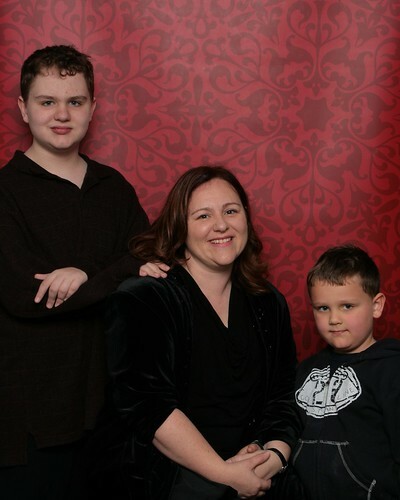 Happy Holidays to all the CareMoms, CareDads and the patients who suffer; we shall be thinking of you. Have you ever watched Phineas and Ferb? It is a great family show on the Disney Channel. The show centers upon the boy Phineas and his step-brother Ferb and the fun-filled days of their summer vacation. In every episode Phineas and Ferb create some amazing mechanical construction in their backyard. They have an older sister named Candace who tries to show their mother these secret impossible contraptions. She always fails and the backyard is returned to its normal state by the end of the episode. I was watching an episode with my five year-old today called Roller Coaster: the Musical. In that episode the boys build a gigantic rollercoaster in the backyard while performing a great deal of singing and dancing. Early in the episode Ferb delivered a line about singing in relation to roller coaster construction that caught my attention. Well, just the fact that Ferb delivered a line caught my attention. Ferb is not as taciturn as the pop culture icon Silent Bob, but for the most part Phineas does all the talking. Ferb: Hmm, what assurance would we have that everyone else will also break into song and do the same thing? Phineas: I don’t know, I think they probably will. Ferb: Fair enough, I’m in. Phineas and Ferb were building a roller coaster. And I am glad the two characters were willing to try to create such an intricate construction even if they were somewhat concerned they might fail. I am glad the very analytical Ferb was willing to leave his comfort zone and without any quantitative data to support his decision. But the problem with roller coasters and the plot of every episode of Phineas and Ferb, is that in the end you end up where you began. It would have been much better if they had built a bridge. Bridges may not be as exciting as roller coasters but they take you down the path. They create a link for communication and you most definitely end up in a new place. 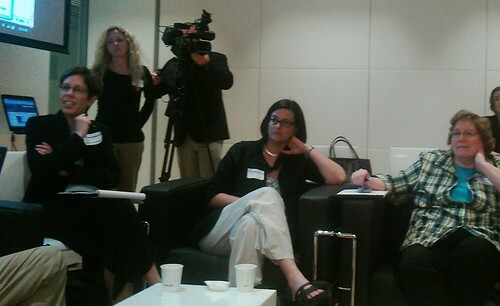 We began talking about a patient speaker’s site at HealthCamp DC on June 8th 2011. A core group of healthcare advocates met in a breakout session. Trisha Torrey, Matthew Browning, Whitney Zatzkin, Carol Torgan, Cindy Throop, Laura Slayton and Chuck Denham were just a few of the advocates in the room. On August 19th, Trisha Torrey and I flew to California to present a webinar with Chuck Denham and the folks from TMIT about the concept. There we live-tweeted and spoke for over an hour about the benefits of patient speakers. I can think of no better picture to represent what SpeakerLink.org is trying to accomplish. Here is the place where the provider can meet the patient; here is a place where positive change begins. Since August we have been promoting the Speakerlink.org within our social media circles. For the past two weeks we have been inviting people to fill out profiles before we announce this amazing resource on the stage at a CMS event Called Quality Net 2011 in Baltimore MD on December 15th. There are currently 61 speakers on speakerlink.org. They hail from 25 states. 17 are also members of the Walking Gallery. 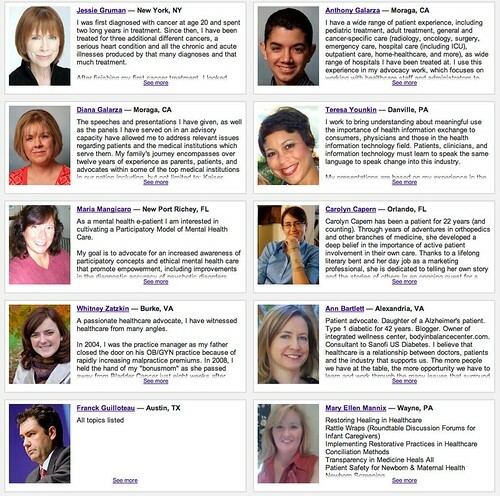 They are doctors, patients, tech gurus, nurses, authors and advocates. All of them agreed to sign up and speak out, many for the first time about their patient stories. I wondered if any paused before making their profile public and wondered who would agree to “sing” with them. There is a certain safety in staying quiet. Perhaps one would look the fool upon the stage if they said the wrong word and could not understand the culture of the watching crowd. There is bravery in being willing to speak. And I thank these speakers for stepping forward. 1977, three bright students who graduated from Stanford University had an idea. Using a mimeograph machine as a printing press, they self-published a book. They set up on street corners and distributed the work by bicycle and backpacks. The name of the book was Juggling for the Complete Klutz. The book launched a publishing company named Klutz Press. I am sure you have seen Klutz Press books. They are very distinctive because the book is usually packaged with all the materials needed to complete an art project, science experiment or some type of athletic endeavor. Klutz Press has literally become a fixture in the world of book and toy stores selling millions of books since it was first created by three young people who thought anyone could be taught how to juggle. They did that by embracing failure as a core design feature. If you have read the Klutz juggling book you know it is full of uplifting cartoons and funny comments about the challenges inherent in juggling. It tells you the many tricks of the trade and explains technique. Most importantly, the book is sold with three square soft juggling balls. It comes with these three practice balls, because you will drop the ball. You will drop the ball again and again as you learn to juggle. The balls are square so they will not roll. They are soft so they will not bounce. This book is a best seller because it embraced the lessons that failure taught. Now, was that so hard? Was that something a grieving mother should wait 10 years for? She posted an incredibly moving post in September of this year about a letter it took her ten years to write.The Letter that took me ten years to write… In January 15, 2001 eleven-year-old Justin underwent a simple surgery to drain an ankle infection. He never awoke again and died the next day. Dale Ann and her family began asking questions immediately but they did not get answers. Instead they were treated to a wall of silence and began a lawsuit against the provider. Dale Ann endured the utter hell of a lawsuit just trying to find answers. And she did not stop there. She spent the next ten years doing advocacy work to help other families to prevent the kind abuse she and her family suffered. Almost ten years after the fatal event that led to Justin’s death, someone reached out to share the true sequence events with Dale Ann. He said he could no longer live with himself knowing that she was still searching for answers. Justin had been overdosed with the wrong medication: Phenylephrine. 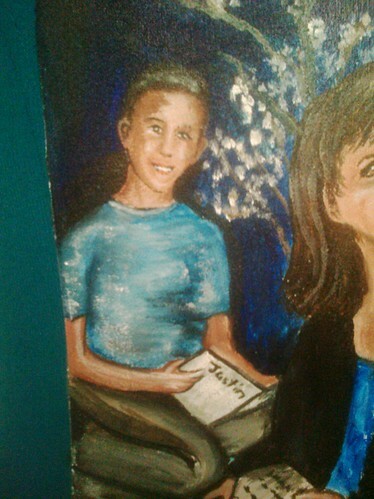 So in Dale Ann’s painting she has two sons named Justin. To the left a young Justin sits. He holds a book open. It is the book of Justin, the book of his life. He is a happy child and frozen forever in his youth. In the center in front of Justin’s garden, Dale Ann sits. She holds a letter of apology that explains the events that led to Justin’s death. To the far right is another Justin. This is the Justin of uncertainty; this is the Justin of what-ifs. Justin would be young man today. He may have looked something like this young man. This Justin holds a closed book and represents 10 years of advocacy and searching for a resolution. Here we reach the balance point of Dale Ann’s life with Justin. She held him close and loved him dearly as a living child for a little over a decade. And for a decade more she held him close as a memory engulfed in a roaring chasm of questions. Now the book is closed and there can be one Justin. And that is just and fair and right as Justin’s name itself. But Dale Ann will continue her journey so others shall not suffer. She will work with providers to help them embrace the lessons of failure and share the healing power of knowledge with others. I know Michelle by a superhero name. She is @cyberslate on Twitter and her avatar is a green She-Hulk. She is super cool. But I didn’t know how cool until the mHealth Summit, for as I left the hall on Monday. I heard, “Is that you Regina?” I whipped around to see Michelle. I asked if she would like to split a cab with me as it is rather expensive to get back to the city from Washington Harbor. She said, No, she had driven out, but would be glad to give me a lift back. She proceeded to give me lifts to and from the conference for the next two days. We talked about everything under the sun including the female condition. Now you may think I mean that we spoke role of women in tech, and we did speak a little on that. After all Michelle is the Enterprise architect and founder of the Women in SharePoint, DC. 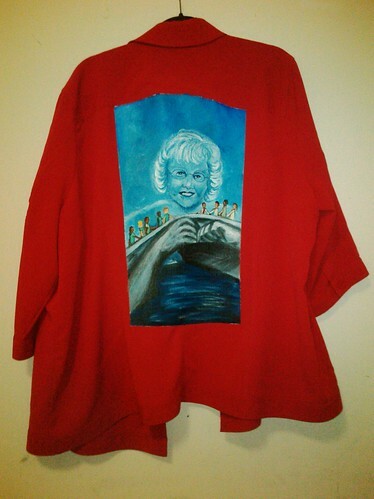 But we spoke specifically of her jacket for The Walking Gallery. This is a painting of Wonder Woman. But this is very different Wonder Woman. 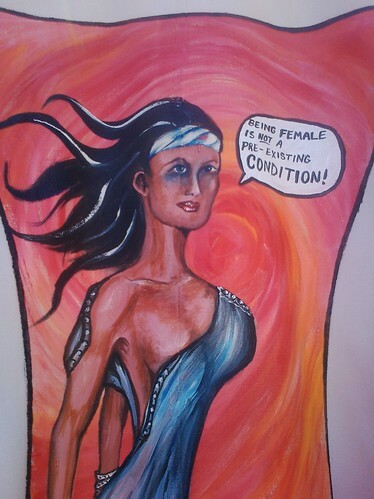 She is a patient and she has suffered from domestic violence. Her eye is bruised; her customary golden tiara has been replaced with a bandage that seeps blood. Her indestructible golden bracelets are removed and in their place is a layered mesh of hospital bracelets that coil around her arms. Her hospital gown is half torn off, revealing most of one breast. This is the kind of hospital gown that snaps across the shoulders. It is never good to be in one of these gowns, it means the patient is using an IV and cannot take off a traditional gown. Cyberslate is brilliant. She has a PHD and can talk circles around most tech gurus. I could paint so many pictures about his woman, but this is the most important one. For even Wonder Woman can fall, even the best and brightest among us can feel the steel gauntlet of abuse. And when that happens, or if that happens, we want to be treated with dignity and respect. We want to be able to receive treatment at any hospital in this fair country without losing future health insurance coverage due to our status as a victim. Thank you Cyberslate for your willingness to speak out for us all, it is your bravery that shall rule the day. When I painted this I thought of you as the lone Amazon fighting against a world of injustice, but now I know you are a super friend. I learned the origin of Cyberslate. I learned that on August 5th, 2009 Michelle was a new resident of DC and to meet friends who shared her interests she decided to join a brand new meet-up group: Health 2.0 Stat. That night she performed her first ignite-style speech. She was one of three speakers. The other two were David Hale from NIH and Mark Scrimshire organizer of the ever popular Health Camps. After their speeches David and Mark found out that Michelle had never heard of Twitter. Right then and there they built her profile and Cyberslate was born. On that day some super friends began to meet each other. But they had no idea we would one day don our capes and mantles. We had no idea that our group of healthcare heroes would one day walk as a mighty force of justice called The Walking Gallery. Do you remember the little red wagon of your youth? I remember mine. I remember the rusty grit of the metal and the embossed grove design on the bottom of the carriage. I remember the wagon was an excellent tool to load piles of fall leaves or dozens of Oklahoma’s native pecans. If my sister Esther and I sat cross-legged we both fit within the wagon as our brother pulled us down the sidewalk. But oh, I would squeal for joy when I would lay down alone in the bed of the wagon and my brother would pull me along. The clouds would race in the sky above me and my hair would rip across my face as we careened down the sidewalk. It would never last long. My brother was only a child himself and could only pull at racing speed for minutes, but how I cherished those minutes of sunshine. When my husband Fred was sick he was not pulled in a red wagon. He was lifted onto a gurney and strapped in place 46 times for transport. He was rolled out of hospital doors and into transport ambulances where EMS teams would transport him for radiation or other treatment. I did the math once and realized that Fred experienced an accumulated three hours of sunshine and fresh air during his eleven weeks of hospitalization due to transport.. He loved his minutes of sunshine. Fred was sick during the spring of 2009 inWashington, DC. If you have ever been to the DC area in the spring, you know our fair city is bedecked with flowers. I remember transport after transport where the blossoms would gently fall upon the gurney as the EMT would push through the doors of the radiation facility. Then the EMT team would leave us in the hall. Gurney after gurney would line the hallway like cattle in their stalls. I would stand by Fred and hold his hand as strangers and technicians would brush by us headed to the waiting room or the chemotherapy suite. Fred would close his eyes and avoid the stares of strangers and the fluorescent glare of the blinking lights of above. He would wait and suffer until it was time for transport again; until it was time for falling blossoms and minutes of sunshine. All of these thoughts and memories flew through my mind as I spoke to David Collins. David Collins is the senior director of Healthcare Information Systems at HIMSS, the largest U.S. cause-based, not-for-profit healthcare association focused on the use of IT and management systems for better healthcare. I saw David in person at the mHealth Summit in Washington, DC. He wanted to talk to me about potentialy speaking at a HIMSS event. I wanted to talk to him about joining The Walking Gallery. Then David did something very few Gallery members have done. He took the jacket off his back and joined the Gallery. He stood in a busy hallway in his dress shirt and poured out his heart and told me why he works on HIT (Health Information Technology). Davis was once EMS. He provided traditional emergency transport, worked private EMT transport and worked within the hospital itself. He helped patient after patient. He saw cancer patients lining corridors like cattle in stalls. He saw patient information lost between facilities and saw how patients suffered when their treatment was delayed by lost data and poor communication. He saw so much that he went back to school to study HIT. 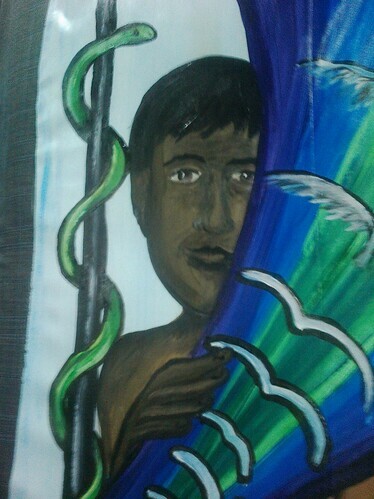 This is what I saw when I stared into eyes haunted with the pain of many yesterdays. But I am so glad that David did not give up. I am glad that David decided to dive into a field that he thought could create the greatest positive change. In this painting only the center is serene. This is the stillness of a moment. In this moment a younger David pulls the gurney with the help of another EMT. The patient looks above to a beautiful blue sky filled with cotton candy clouds. I wonder if this patient feels as I did in my little rusty wagon. Does he rejoice that he is still alive when death looms so very near? 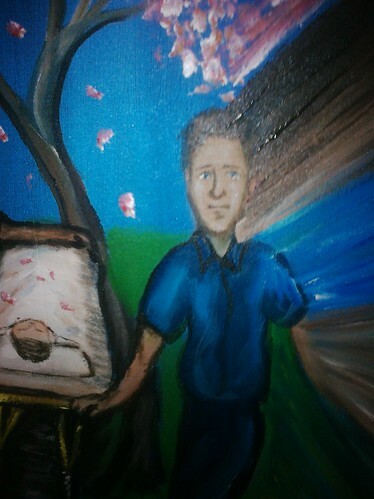 David looks upon the viewer as he transitions from the stillness of the past into the speeding present. Time is a smear of paint upon a jacket. Now time is speeding up. Now Meaningful Use is marching through its measures, EHR venders pop up like mushrooms after rain and David looks upon it all to judge safety and quality of systems. As David left the Mobile Health Summit with his Jacket on his back, I saw him from a distance. From a distance the patient head looked less like a head resting on a pillow and more like an eye staring back at me. Yes, there is an eye in HIT. It is the Patient view. Thank God, David has that view firmly in mind. 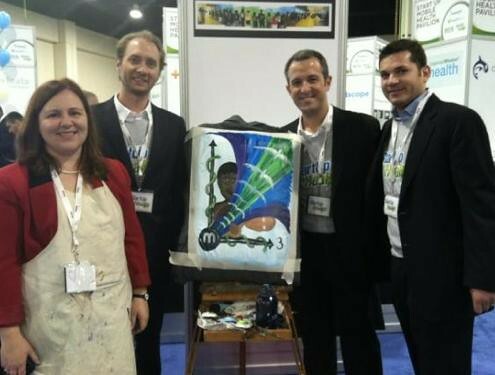 Yesterday I had the privilege to paint at the mHealth Summit in Washington, DC. I was in booth 135-6 in the Start-up Pavilion hosted by StartUp Health. I came to the conference because Chiara Bell was showing her new product: CareTicker and asked me to attend. 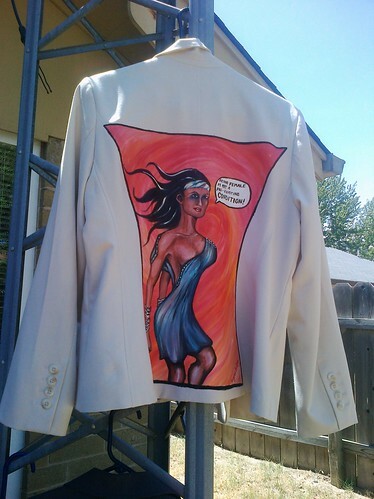 I responded by begging to have space in her booth to paint jackets for The Walking Gallery. She asked Gregory R. Itzenson if we could share the booth. Gregory responded back there was still time to reserve my own space. Due to the diligent work of both Chiara and Gregory, I had a booth in time for the show. Sadly, this did mean I would miss IHI in Florida this year, but I was sure the many wonderful patient advocates that attended IHI would represent the patient view. I knew I would be one of the few patient advocates attending Mobile Health. 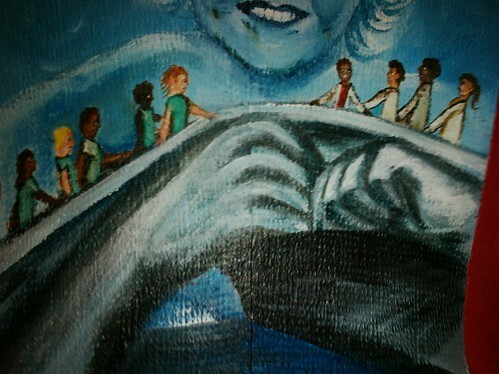 I also was so glad to hear The Walking Gallery would be represented in both places. Mary Ellen Mannix would wear her jacket “Never Enough” and Dale Ann Micalizzi would wear her new jacket “Tales Two of Justins.” It was great to represent both The Walking Gallery and the launch of the new healthcare/patient speaker portal: SpeakerLink.Org. 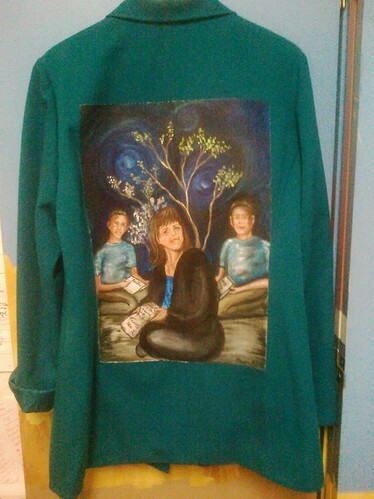 So at 11:00 am in the far corner of the exhibition hall I painted on the jacket of Robert J. Filley. He is an artist member of The Walking Gallery who has painted three jackets and is also the husband of Anita Samarth the co-founder of Clinovations. He asked me to paint the jacket he would wear. So I painted the Mobile Health Summit on his back. 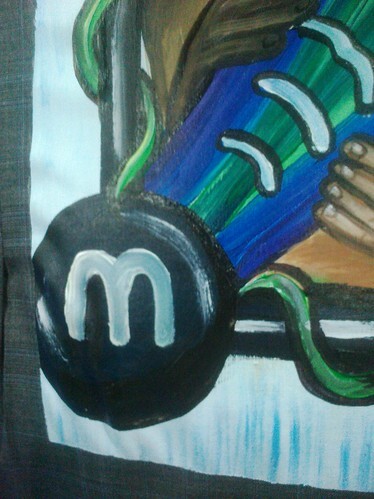 In this painting the logo image of the “m” becomes the center of a clock face. From the “m” a Wi-Fi signal emanates and grows larger forming into birds. These are birds of peace and freedom. For this is the promise of mobile health wherever you are mobile health can help you, be it in an African savannah or a hospital bed. These birds fly above a curtain created from the colors of mHealth conference. Behind this curtain two figures stare at the viewer. Several people spoke to me while I was painting. They asked, “What purpose could art serve at a technology conference?” Well, art is just tool as tech is just a tool. They are tools to communicate with patients. We must never forget all of this exists to help patients have a better health experience. Finally to the far left and on lower part of the painting, there are clock hands. It is three o’clock. It is three o’clock for a few reasons. One reason is hospitals often have early morning blood draws or vitals checks, which is great for the hospital system but not so good for a sick patient who needs rest. It is also 3:00pm for moment in a conference day when exhibitors are so very tired, yet they still stand on aching feet and smile as they answer questions. 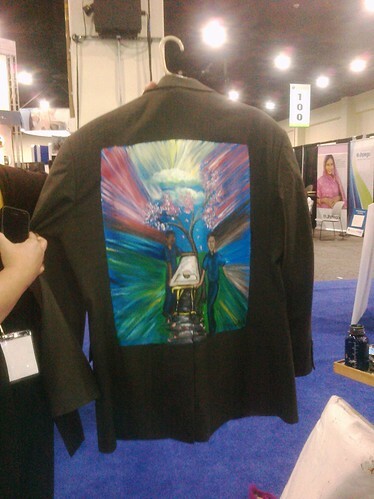 And it is three o’clock because at 2:55 pm Anita Samarth found my booth and I explained the vision of this jacket. I am so glad her wonderful husband will get to wear it, but until then it will hang in the offices of Clinovations telling one and all about the communication power of Mobile Health. When I think of SpeakerLink.org, I think of the strength of a chain. I think of the power inherent in each link and of the smiles of a little boy named Isaac. When my son Isaac was only three years old his favorite toy was not a toy at all. It was a chain. It was a heavy 16-foot-long chain. He would drag it along the floor and pretend it was a boa constrictor. He loved that “snake.” He would lift its heavy coils of links and smile in ecstasy. I suppose some parents would not let their children play with a heavy chain and lift its steel links. But, I thought that as long as it was supervised play, it was a great type of play and fulfilled Isaac's need for deep pressure. 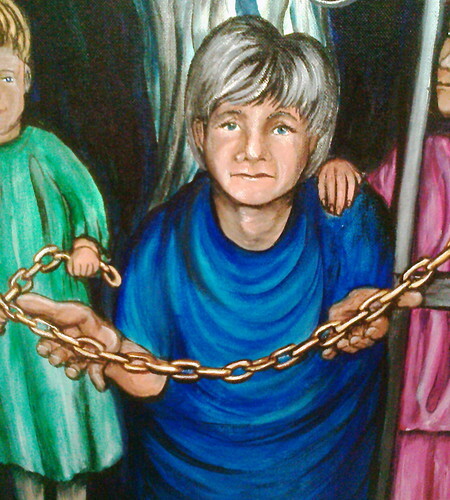 After all, as a child I too lifted chains. My father was a junk dealer and he sold many types of chains. I remember some links that were as big as my fist. Those chains were so very strong. I learned a lot about chains. They were strong but flexible: able to bear great weight. They were so strong because of the links. Those beautiful curved zeros of steel would glide out of my hand as I placed them on the flea market stall floor. One link after another would fall. First on its edge then on the flat, I remember it as a repeating series of 1's and 0's gliding by like some type of iron-age binary code. The links were important in that they made the whole. 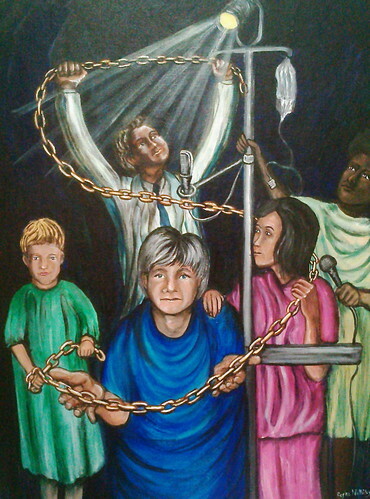 A great burden could be lifted by the strength of such a chain. I am inviting you to be part of a chain today, a really important chain. For the past six months, the team from TMIT (Texas Medical Institute of Technology) and I have been working on a project. Well, really they have been working on many projects. They have made films on patient safety, worked on standards, and went to meeting after meeting with thought leaders on better patient care. But the one project I have worked with them on is Speakerlink.org. Six month ago TMIT CEO Chuck Denham, MD, asked me what did I think was the most important thing TMIT could do to improve patient care, safety and advocacy. I told him we needed a patient speakers bureau. He and the rest of the team broadened that vision to include speakers from every segment of society who identified with a patient centric view. And if you click on find a speaker you will see this. If you scroll down you will see more speakers. You will see more amazing people who have decided to change the world, who refuse to accept phrases like “that is just the way it is.” You will see mothers who have lost sons and wives who have lost their husbands, you will see people who have lost so much. But they have not lost hope. You will see people who have dedicated their lives to guiding health policy. Individuals who have devoted years to health information technology and patient safety legislation have profiles on this site. And you will see regular citizens who have no training in rhetoric here as well. They speak because they must. They speak because they are brave and are willing stand up and speak out if they can make a difference by sharing their story. But this site is missing something. It is missing you. Register as a speaker. Speak for those you love. Speak for the anonymous millions that exist as a cold data set with no emotional impact. Be a speaker from experience with patients you have helped or as the patient you have become. Be a speaker for the dead. But most of all speak. For your voice is mighty and true. It swells and fills the auditorium and fills the mind. You have the power to change things. You have the power to be part of a chain reaction. For the hospital boards, the-C suites, the QIO’s, the Physician and Nursing Groups, the Venders and the Patient Communities are all links in a mighty chain of care. Speakers connect these groups, speakers go from place to place introducing new ideas, different cultures and share the wisdom stored in so many silos of medicine. You can become the link I know you are; for you have been through the crucible and have come out the other side. You have been forged into the finest steel: flexible yet strong. So, here is my request. Sign up. Become a speaker. Change the world.